Villa Luciana is located in Piteccio, a magnificently restored 17th century ruin, and is surrounded by the gentle Pistoian countryside. The house is nice,bright, spacious, has a tasteful interior, with a rural Tuscan atmosphere, and is equipped with all comforts. The tranquility of the woodlands, the authentic local produce, the changing colors of the seasons, the clear water in the streams and lakes all make this the perfect place for a holiday set in natural and peaceful surroundings. You can really leave all the noise behind you and find complete privacy and tranquility in this region. The house offers splendid, panoramic views across its surroundings and features a large garden equipped with comfortable furniture and a barbecue for some lovely moonlit dinners. Mrs. Luciana will give you a warm welcome and she will surprise you with a culinary treat! 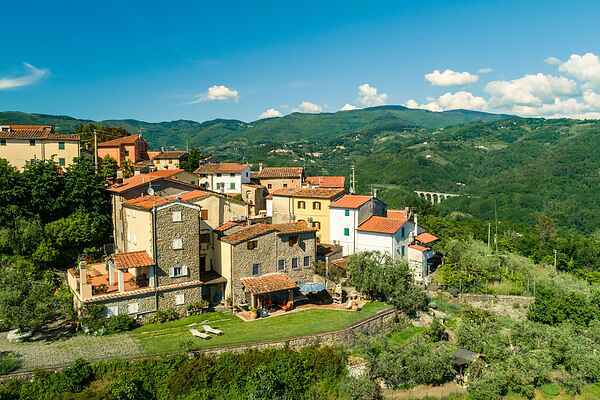 Villa Luciana also makes a perfect base for exploring the most important and well-known Tuscan cities including Florence, Pistoia, Lucca, Pisa and Siena with their spectacular monuments, museums and history. The sea is less than an hour's drive away. Piteccio is a small village, situated on the river Ombrone, around 10 km away from the city of Pistoia, 25 km away from the city of Montecatini Terme (remember to try the delicious 'cialde') and only an hour away from the sea. You can play tennis, go swimming and horse riding here, and if you are visiting in winter, you could even go skiing on the Abetone. Charming apartment dating from the 17th century, completely restored and surrounded by the mountains outside Pistoia. Furnished with care. Light and spacious. Hospitable and functional. With all the amenities for those who want to spend their holidays in contact with nature and tranquility. Away from the noise and in privacy and rest. With its own courtyard with comfortable garden furniture and barbecue. Luciana offers you a warm welcome with a local tasty surprise! And this is the ideal base for visiting all major Tuscan cities like Florence, Pistoia, Lucca, Pisa and Siena, with their spectacular monuments, museums and historic buildings. Piteccio is a small village located along the river Ombrone 10 km from the town of Pistoia, 25 km from the spa town of Montecatini and only one hour from the sea. In the surrounding area you can enjoy various sporting activities such as hiking, mountain biking, tennis, swimming and horse riding.